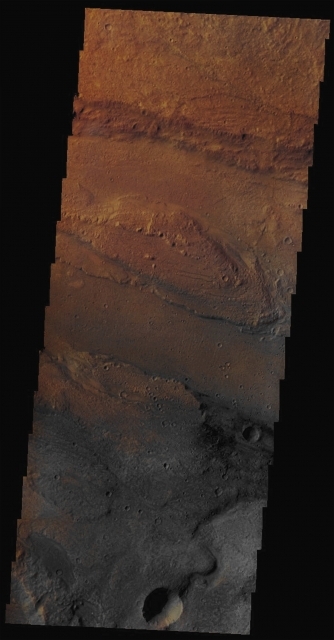 In this impressive VIS image, taken by the NASA - Mars Odyssey Orbiter on July, 9th, 2002, and during its 4.482nd orbit around the Red Planet, we can see - after the APOD of January, 2, 2015) another relatively small portion of the Floor of the huge Martian Outflow Channel (carved by fluids, perhaps even water - but nobody can be sure about this circumstance so far) known as Ares Vallis, with a huge "Insula" (a Latin word for "Island") in it. Note that the very different colors which characterize the Northern side of the picture (brown/orange) as to the Southern one (gray) may be the well visible consequence of a deeply different Mineral Composition of the two Surfaces; on the other hand, the different colors of the Surface might be related (and we, as IPF, prefer this idea) to the different amounts of Micro-Particles of Dust (---> orange-colored) and Volcanic Ashes (dark gray-colored) that deposited on the Surface of this Area. If this second scenario were true, we might assume that the Aeolian Action working of the Southern Side of the Ares Vallis is much stronger than the one working on its Northern Side. Furthermore, do not forget that both Dust and Volcanic Ashes stick on the Martian Surface (---> Soil) in VERY differeet ways; in this case you might consider, for instance, the basic nature and composition of the Surface where they fell down and created either thicker and compacted (---> and therefore hard to be blown away) or thinner deposits (---> easy to be blown away by the powerful Martian Winds). This image (which is an Original Mars Odyssey Orbiter false colors and Map-Projected frame published on the NASA - Planetary Photojournal with the ID n. PIA 19215) has been additionally processed, magnified to aid the visibility of the details, contrast enhanced and sharpened, Gamma corrected and then re-colorized in Absolute Natural Colors (such as the colors that a normal human eye would actually perceive if someone were onboard the NASA - Mars Odyssey Orbiter and then looked down, towards the Surface of Mars), by using an original technique created - and, in time, dramatically improved - by the Lunar Explorer Italia Team.